I know that this time of year most people expect a spooky book recommendation. And though I have those in spades and am always happy to give one I felt that something more important needed to be addressed. The power and pure awesomeness of women. I am sure that we are all aware of codebreakers. If anyone has ever read or seen Dan Brown's The Da Vinci Code, you know that there are people that can see scrambled messages and figure them out. People that are good at word searches and crossword puzzles probably have the same tendency as well. But did you know that one of the very first cryptologists in the world was a woman? That all modern codebreaking came from the techniques that she developed with her husband? Probably not. Not many people know any of that. Because for years her story was forgotten and hidden away, tucked behind and folded into her husband's. Until now. In The Woman Who Smashed Codes Jason Fagone brings to life Elizebeth Smith Friedman. A woman who grew up in a small town the youngest of nine children with a very unassuming name but rather big dreams. Determined to make something of herself she went to college despite her father telling her not to. After attending two colleges to get her degree in English literature Elizebeth decided she wanted to see if she could make it in the wider world. She tried over and over again to get clerical work or work at a library but was constantly unsuccessful. Just as she was about to give up and move back home she met George Fabyan. An eccentric millionaire that hired her to come and work with Elizabeth Wells Gallup on uncovering the Baconian secrets hidden in Shakespeare's works. Taking a leap of faith she agreed, and so began a journey that would lead to stopping gangsters during prohibition, catching Nazi spies and ultimately helping shape the way codebreakers work today. In Jason Fagone's introduction he explains that most people have no idea who Elizebeth Smith Friedman was other than William Friedman's wife. But that she was quite a woman in her own right. And what a woman she was! Mr. Fagone brought to life and to light a woman that became one of the most important people in our nation's history. I was totally captivated by this incredible woman. She defied custom to go out and do what she wanted. She went to college, she found herself a job doing something that was unconventional for women and followed her own path. How could you NOT love this woman? In today's political climate a lot of our lawmakers are beginning to believe that women belong in the home. That women shouldn't get to choose what works for them. But people also say that history teaches us, and despite the inequalities that abound, history shows us again and again that women were what kept this country going. Mr. Fagone shows us that without women like Elizebeth Smith Friedman the world would be a much scarier place. Without her code breaking skills we may have had a much harder time rooting out the enemy during WWII. Basically this woman was awesome. I thoroughly enjoyed learning all about Elizebeth Smith Friedman and felt that Jason Fagone had really done his research well. Sprinkled through the book were various tips and tricks on how to break various codes. It was a fascinating look at how codes evolved over time, starting from the simplest cipher that Mrs. Smith Friedman originally learned how to break to more complicated codes that she learned to read all the way to the binary codes that make up computers. I mean how cool is that? I think that Jason Fagone did an excellent job bringing her story into the world. There were times when I felt he may have gotten too wrapped up in some of the minor details. I loved the attention to detail, so that no matter where we were in the timeline the reader knew what was happening. But there were times when I felt that took away from the story of what was happening with Elizebeth and her team. In general though as I was reading I was inspired by the story. All around The Woman Who Smashed Codes was a fascinating read. I feel that the world has a few female heroes, Ruth Bader Ginsberg, Marie Currie, Michelle Obama, but I feel that there are never enough. I believe that Elizebeth Smith Friedman should be added to that list. She did so much for this country and proved that being a woman doesn't have to hold anyone back. She was told again and again to just sit down and follow orders and she refused to do that. She stood up and followed her heart and help the world break some of the hardest codes out there. Elizebeth Smith Friedman started off as someone that people went to because the couldn't get her husband's help and turned into the woman that everyone sought. 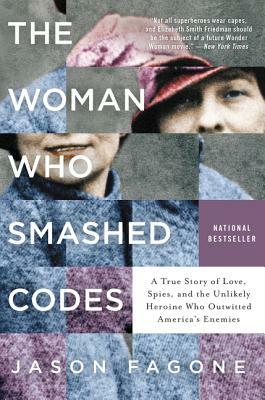 The Woman Who Smashed Codes by Jason Fagone is an inspiring story that is a must read. Come by your local Book Culture and pick up a copy today!